Voice over IP or VoIP, is simply sending voice over an existing Internet connection. With its extensive feature set, VoIP is quickly out pacing its digital and analog counterparts, so it's not a matter of if, but when. Recent estimates show implementation of VoIP by US businesses are near 40%, with the percentage expected to soar past 50% in early 2016. With over 30 years in business, CompTel's technical staff has over 65 years combined telecommunications experience. We have been supporter of VoIP since its inception and have helped bring VoIP to our customers throughout Dallas and Fort Worth (DFW). 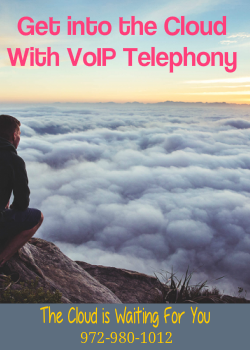 As early adopters, our customers have experienced many of the benefits of VoIP. In most cases all it takes is just plugging your VoIP devices in. If you are not comfortable with that or do not want to crawl around on the floor, then CompTel can provide trained VoIP installers to assist with your installation. Either way, we will be with you every step of the way. Not only do we help decide which VoIP service is right for your company, we install and maintain all type of analog, digital and VoIP business phone systems. Once we complete an audit of your business, including analyzing costs, demand and future business growth , we will recommend hardware from our extensive partner relationships and our VoIP partners as well. Like traditional business phone systems, on premise VoIP utilizes some kind of hardware controller installed in your place of business. The setup may be purely VoIP or a hybrid solution including analog, digital or VoIP hardware. All VoIP products provided by CompTel, follow the internationally accepted SIP (Session Initiated Protocol). As a result, clients have flexibility to choose from a variety of phone receivers, and plans with installation and maintenance costs minimal. Hosted or cloud-based VoIP utilizes a large network of shared servers tucked away in even larger data centers. Hosted VoIP appeals to many large enterprise and multi-location businesses as it does not require expensive physical hardware, such as an IP PBX. Without the need for a PBX in multi-locations businesses, fixed costs, implementation and hardware costs can be kept to a minumum.